My mom has always been a huge influence in my life- as a friend, a role model and someone I grew up wanting to emulate. She has always been the true matriarch of our family, keeping my siblings and our families close to each other and a huge part of all our lives. Our friends and family have been there for every step of my mom’s journey – cooking and bringing her meals, being at every doctor appointment and surgery, visiting constantly at every hospital stay and at home, keeping my dad company, taking walks together, running errands for her, sending gifts to keep her spirits up, constant phone calls and just being there for everything she wanted and needed. After grueling chemotherapy and a couple of related hospital visits, my mom was really weak and sick. She was pretty adamant that she was not willing to go through a Whipple surgery and the horrible recovery everyone told her would follow. 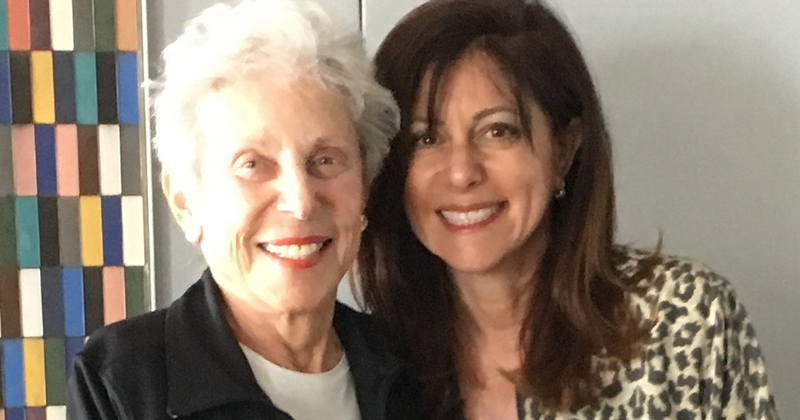 When my sister found a doctor at the Mayo clinic performing laparoscopic Whipple procedures, my mom’s attitude shifted to being her former strong self, certain she could get through that (much easier) recovery and anything that followed. Watching her put aside her fears and find her strength again was truly awe-inspiring! My mom’s diagnosis, treatment and recovery have made my family closer. We came together to make sure my mom and dad had everything they needed – and we all know now that we are truly there for each other, no matter what. My 90 year old father’s strength and love has been amazing as well. He has been a rock for all of us, and his optimism kept everyone’s spirits up throughout. I hope I let my mom know every day (not just on Mother’s Day) how important she is to me, how much I love her and how grateful I am for every additional day I get with her! *Sari’s mom, Ronnie, was diagnosed November 2015.